This broad major can prepare students for the business of horticulture with concentrations in Horticultural Production and Marketing or Landscape Horticulture and Design, or it can be focused on education and communication through Public Horticulture, or it can lead to a research and development career via the Plant Science concentration. Horticulture applies knowledge from many disciplines, including biology, chemistry, ecology, engineering, communications, business, and education to solve real world problems related to the production, marketing and management of landscape plants, flowers, fruits and vegetables. Purdue captured my interest because of its outstanding horticulture program and horticulture growth facilities. When I visited, a faculty member gave me a tour of the horticulture facilities. I love how beautiful the campus is, especially Horticulture Woods. Other schools I applied to didn’t take the time to get to know me. The college visit is so important; it was one of the deciding factors in my coming here. I work in the Purdue greenhouses, helping researchers and students with experiments in the hydroponics units. Everyone is so friendly. I love the faculty and how open and accessible they are to students. Horticulture majors are a small, tight-knit group. Most of us are also in Horticulture Club, so we see a lot of each other in and out of class. I’m a member of MANRRS—Minorities in Agriculture, Natural Resources and Related Sciences—and it really helps me grow professionally. I know how to build a resume and how to interview with companies. We also do community service projects, everything from organizing a clothing drive to adopting a highway. I rely on the members; they have become a second family to me. It’s a good support system. 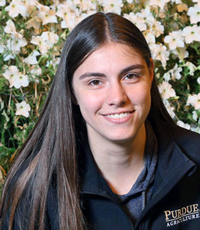 Purdue opened my mind to the different career choices available, and my plans changed from when I was a freshman. Initially, I wanted to own a greenhouse, but now I want to go into plant breeding or plant propagation. I’m pursuing research and development internships and checking out graduate schools.